Recommended with AP 100 Battery & AL 300 Charger. 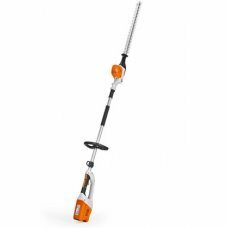 High performance long-reach hedge trimmer. Battery-powered. The HLA is an ergonomic and well-balanced tool that maintains a constant engine speed regardless of the load. Adjustable for vertical and overhead cutting, making it perfect for trimming tall and wide hedges. High performance long-reach hedge trimmer. Battery-powered. The HLA 65 can be folded down to a length of just 125 cm so it fits easily into a car. Adjustable for vertical and overhead cutting.